1) This week we're going to look for men's facial hair in our photograph collection. 2) Find one or more photographs of men in your ancestral families that have facial hair - a mustache and/or a beard. 3) Show the photograph if you have it and tell us a bit about the person shown. If you don't have a digital photograph, please describe the man and his facial hair the best you can. This photo was taken in Concordia, Kansas between 1875 and 1885. Devier was a livery business owner, horse trader and land speculator in his adult years. I think that is probably a buggy whip in his right hand. 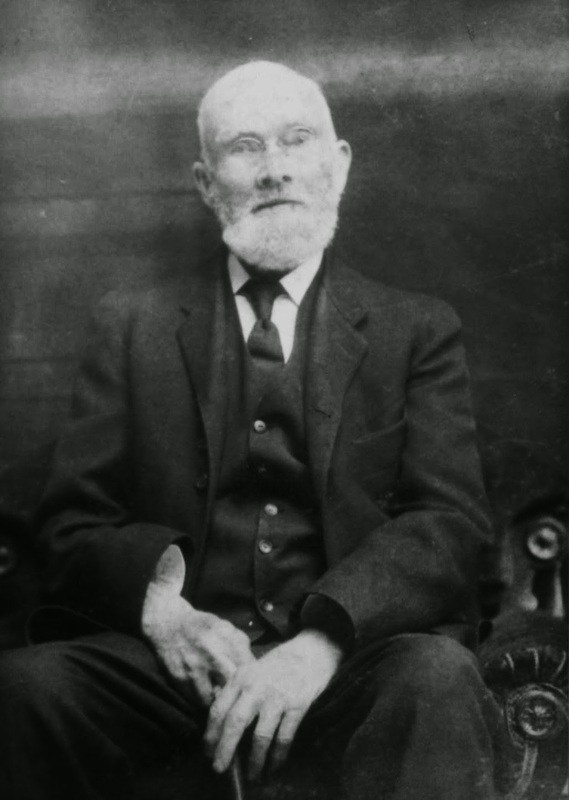 This photograph was taken in about 1890-1900, in Putnam, Connecticut, when James was elderly. 3) I have several ancestors who had mustaches - I'll save them for another time. I am in the 8th great-grandmothers and I'm up to Ancestor #1059 who is Sarah CLARKE (1639-1716) [Note: the earlier great-grandmothers and 8th great-grandfathers have been covered in earlier posts]. 1058. Joseph Benjamin, born 16 September 1633 in Cambridge, Middlesex, Massachusetts, United States; died April 1704 in Preston City, New London, Connecticut, United States. He was the son of 2116. John Benjamin and 2117. Abigail Eddy. He married 12 December 1668 in Yarmouth, Barnstable, Massachusetts, United States. 1059. Sarah Clarke, born 01 August 1639 in Yarmouth, Barnstable, Massachusetts, United States; died after 1716 in probably Preston, New London, Connecticut, United States. * Joseph Benjamin (1673-1738), married 1698 Elizabeth Cooke (1678-1738). * John Benjamin (1682-1716), married 1705 Phoebe Larrabee (1680-????). 2119. Sarah Lumbert, born about 1620 in England; died 06 September 1675 in Dorchester, Suffolk, Massachusetts, United States. * Sarah Clarke (1639-1716), married 1668 John Benjamin (1633-1704). The William Clarke family is not treated extensively in the published or periodical literature. William Clarke left his estate to his son-in-law, Joseph Benjamin, in a nuncupative will. Episode 473 of "I'd Rather Be Lucky Than Good!" I posted 52 Ancestors in 52 Weeks - Week 45: #52 Ranslow Smith (1805-1873) today, and noticed that I knew where Ranslow Smith was buried, but that I didn't have a gravestone photograph. I did have a source from a cemetery inscriptions book I found at the Family History Library for Empire Presbyterian Cemetery in Andrew County, Missouri. So I thought to myself - "maybe I can request a photograph of the gravestone!" Of course, I should have thought of that years ago after I found the cemetery inscriptions book. Then I thought "hmmm, I wonder if there already is a memorial for Ranslow Smith? I'll check Find A Grave!" This truly tells me something about Devier J. Smith. I believe that he was very devoted to his father, and appreciative of him. Ranslow and his wife, Mary Bell, adopted Devier at an early age in Jefferson County, New York between 1839 and 1842, and Devier grew up in the Four Mile Inn in Burnett, Dodge County, Wisconsin. Devier ran the livery stable of the Inn as a teenager and that led to his career as a livery man, a horse trader, a land speculator, and snake oil salesman. 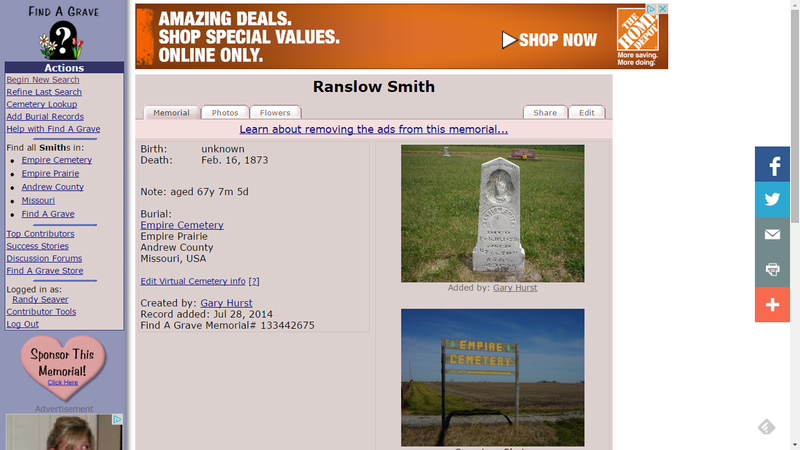 The Find A Grave memorial for Ranslow Smith was added in July 2014 by volunteer Gary Hurst, and credits the Andrew County Historical Society for the photographs. 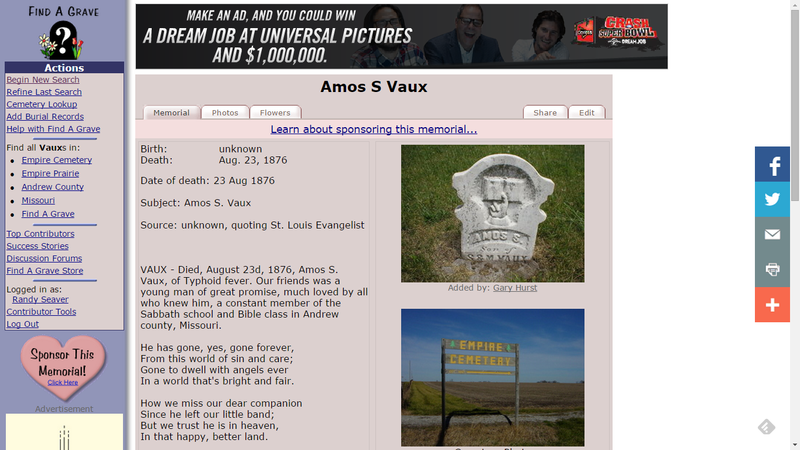 I found that there is an Andrew County cemetery website, with links to photographs of gravestones, at http://www.rootsweb.ancestry.com/~moacc/cemeterylist.htm. That is a wonderful help for researchers in this county. Like I always say, "I'd rather be lucky than good!" This happens to me often, it seems. Someone more famous said "Luck is the residue of design..." and I agree with that too. The lesson learned here is: Check your favorite genealogy data providers on a regular basis for new records of your ancestral families. 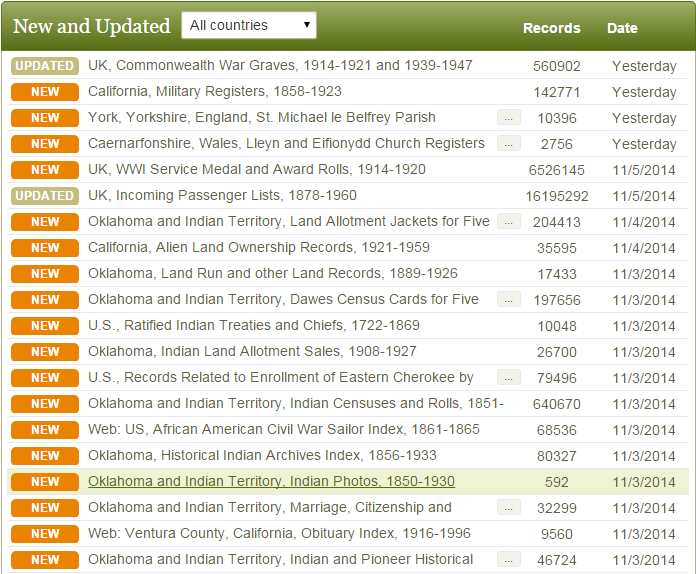 The following databases were added or updated on Ancestry.com during the period from 1 to 7 November 2014. The complete Ancestry.com Card Catalog is at http://search.ancestry.com/search/CardCatalog.aspx. There are 32,483 databases available as of today (an increase of 16 over last week. Ranslow Smith (1805-1873) is #52 on my Ahnentafel list, my third great-grandfather. He married in about 1835 to #53 Mary Bell (1805-1865). Ranslow and Mary (Bell) Smith's birth dates and Mary's death date are in the Devier and Abigail (Vaux) Smith Family Bible records in the possession of Randy Seaver. The first record found of Ranslow Smith is in the 1830 census for Jefferson County, New York where he is listed in Henderson township as age 20-30 living with a female aged 20-30. Other Smith families in Henderson in the 1830 census were headed by Lyman (aged 20-30), Jesse (age 40-50), Asa (age 50-60), Horace (age 60-70), Beebee (age 30-40), Anson (age 30-40), and Harvey (age 20-30). The new name in this list is Horace Smith. No information has been found for the marriage date of Ranslow Smith and Mary (Polly) Bell. Since they were married at the time of the writing of the deed by Mary's father, James Bell, in 1839 in Jefferson County, New York, it is certain that they were married before the deed was written. The Abigail (Vaux) Smith family papers list the birth dates of Ranslow Smith and Mary Smith as 1805. An approximate marriage date of 1835 is an educated guess. In the 1835 New York State census for Henderson, the Ranslow Smith family has 1 male (1 age 18-45, 1 voter) and 1 female (1 married under age 45). On the same page of the census, but not listed immediately above Ranslow Smith, are Ahira Smith, Bebe Smith and Ansel Smith (these three are listed immediately after each other) and Ashby Smith (below Ranslow Smith). On other census pages are Samuel Smith, John Smith and Sylvester Smith (listed immediately after each other), Jesse Smith, Harvey Smith, Johnson smith and Lyman Smith. On 19 April 1837, Isaac Bronson and his wife Anne of Henderson sold land to Ranslow Smith of Henderson for $750.18. The tract of land in Henderson contained 126.56 acres and was defined by metes and bounds starting at the northeast corner of Lot 23. A newspaper article in the Watertown (NY) Daily Times, titled "Old Houses in the North Country," number 516, describes the Ranslow Smith house in Henderson town. The house, built of native limestone, is claimed to have been built in 1839 upon a tract of 177.18 acres and there is a deed of 126.56 acres in the same are from Isaac and Anne Bronson of New York City to Ranslow Smith. The name "R. Smith" is carved into the lintel over the door. The house has five large rooms on the main floor and three bedrooms on the second floor. There was a kitchen fireplace and Dutch baking oven in the basement. On 12 May 1840, George Smith (and his wife Mary) and Lyman Smith (and his wife Lydia), all of Henderson, sold three tracts of land in Henderson to Ranslow Smith of Henderson for $341. The first tract was part of subdivision two in Great lot 44 in Henderson, containing 91 acres, bounded north by land of Calvin Bishop, west by the center of the highway, south by land of George Smith and Lyman Smith, and west by land of Amasa Brown. The second tract contained 12 acres of land in Henderson, bounded by metes and bounds, and bounded at the northwest corner by land of Daniel Haw. The third tract of land contained 9-3/4 acres and 22.2 rods of land in Henderson, bounded by metes and bounds, starting from the center of the highway opposite Sprague's sawmill. * a female age 30-40. Other Smith families living in Henderson in 1840 were headed by Samson, Ansel, Samuel, Lyman, Beebe, John, Sylvester, Oren, Harvey, Milton, Lyman D. and George Smith. On 15 October 1840, Ranslow Smith and his wife Mary of Henderson sold 91 acres of land to Charles W. Bishop of Henderson for $2,600. The tract was part of subdivision two in Great lot 4 (or 44?) in Henderson, bounded on the north by land of Calvin Bishop, east by the center of the highway, south by land formerly owned by George Smith and Lyman Smith, and west by land of Amasa Brown. On 6 February 1841, Ransler Smith and Mary his wife sold two tracts of land to George and Lyman Smith, all of Henderson in Jefferson County, NY, for $1,000. The first tract was part of Great lot 44 in subdivision 2, containing 9-3/4 acres and 22.2 rods, and defined by metes and bounds. The second tract was 12 acres bounded at the northeast corner by land formerly owned by Daniel Hawe and now owned by Samuel Griggs, then defined by metes and bounds. There are no other land records that show Ranslow Smith selling his lands in Henderson before moving to Wisconsin. George Smith (with wife Mary), and Lyman Smith (with wife Lydia) also lived nearby in Burnett. Note that these were the Smith people who bought and sold land with Ranslow Smith in Henderson. It is probable that the three are brothers or cousins. "'Old World Wisconsin' at Eagle, WI, an outdoor historical site of recreated villages has "The Four Mile House," commonly called the Smith House, after the 1st owner, Ranslow Smith. He ran it as a stagecoach inn. My great grandfather, Eldridge Smith bought it from him. The building was on the corner of Prospect Road and Highway 26 in Oak Grove township, which was about 4 miles east of Beaver Dam, not far from Burnett. The historical society moved it to 'Old World Wisconsin.' Do you have any information that connects him to Eldridge Smith or 'the Smith triplets' of Connecticut about the time of the Revolutionary War?" * Nineteenth Century English Immigration and Settlement in Wisconsin - V -- page 70. The report states that George Smith and Lyman Smith were brothers of Ranslow Smith, and that they were all sons of Russell and Esther (--?--) Smith. The family resided in Oneida County NY in the 1805 to 1815 time frame. On an 1859 Platt book for Dodge County, R. Smith was living in section 29 of Burnett township, on land near land of S. Vaux. A business directory (no date found) for Dodge County listed Ranslor Smith as a hotel keeper in Rolling Prairie. Ranslow Smith's wife, Mary (Bell) Smith, died in Dodge County, Wisconsin in 1865. After her death, Ranslow moved with his son Devier, and Devier's wife, Abigail A. (Vaux) Smith, to Benton township, in Taylor County, Iowa in 1867. "O.H. Crowl has purchased the old stand and farm occupied formerly by Ranslow Smith, and has moved in, and is in full possession. " Ranslow Smith bought 80 acres of land in Taylor County, Iowa from the William Lewis estate for $220. The parcel was the west half of the Southeast quarter of Section 21 in Township 68 north in Range 33 West. On 2 March 1868, Devier J. and Abbie Smith sold land in Taylor County, Iowa to Ranslow Smith for $500. The land comprised 80 acres, the West half of the Southwest quarter of Section 23 in Township 68 North, Range 34 West. The deed was recorded in Taylor County Deed Books on 2 March 1868. Ranslow Smith married (2) Mrs. Julia M. Johnson in October 1868 in Taylor County, Iowa at her home by C.C. Baird, Baptist Minister. On 16 March 1869, Ranslow and Julia Smith sold land in Taylor County, Iowa, comprising 80 acres in the West half of the Northeast Quarter of Section 23, Township 68, Range 33, to Harley U. Greenlee for 640 dollars. The deed was recorded 11 May 1869. On 15 December 1869, Ranslow Smith bought about 65 acres in Taylor County, Iowa, in the Southwest Quarter of Section 7, Township 69, Range 34, from John E. Craven and his wife for $500. The deed was recorded on 23 September 1869. On 15 September 1869, Ranslow Smith bought 80 acres of land in Taylor County from Esther and John Craven for 500 dollars. The land was the West half of the North East quarter of Section 17, Township 69 North, Range 34 West. On 15 September 1869, Ranslow and Julia Smith sold 80 acres of land in Taylor County, Iowa to Devier Smith for 500 dollars. The parcel was the Undivided one half of the Southwest quarter of Section twenty three, in township Sixty Eight North of Range thirty four West. The deed was recorded in the Taylor county Deed Recorder's office on 23 September 1869. Ranslow Smith moved to Andrew County, Missouri after selling his property in Taylor county, Iowa. He died in Andrew County, Missouri on 16 February 1873, aged 67 years, 7 months, 3 days. He was buried in Empire Presbyterian Cemetery in Andrew County, on Highway 48 near Whitesville and King City, and about one mile south of the present church site. I, Ranslow Smith of the town of Oak Grove, County of Dodge, and State of Wisconsin, being of sound & disposing mind and memory and of full age do make and publish this as my last will and testament, as follows, that is to say. First. I will and direct that the expenses of my funeral and all my just debts be fully paid out of my personal estate, as soon as may be after my decease. Second. I hereby give, devise and bequeath to Mary Jane Bell, the wife of Lucius Sanborn now in the state of Iowa, the sum of three hundred dollars out of my estate, what shall be left after my decease, and in Case of her decease before me, the said sum to be paid to her heirs. Third. I hereby give, devise and bequeath unto Devere J. Lamphear, Commonly called Devere J. Smith, my adopted son, all the rest and residue of my real and personal property of every name and nature whatsoever, except the above named Legacy: To have and to hold the said real estate and personal property by the said Devere J. Lamphear and his Heirs and assigns forever: and I also give and bequeath to the said Devere J. Lamphear my life insurance in the North Western Life Insurance Company, which was formerly secured to my deceased wife, and as she is dead now, I will that the said sum shall be paid to him after my decease. Fourth and lastly: I hereby appoint the above named Devere J. Lamphear, commonly called Devere J. Smith, Executor of this my last will and testament and I do hereby revoke all former wills by me made. In witness whereof I have hereunto set my hand and seal this twenty second day of June in the year of our Lord, One thousand eight hundred and sixty five. The foregoing instrument, consisting of one sheet was now here signed and sealed by Ranslow Smith the testator, in the presence of each of us and was at the same time published and declared by him to be his last will and testament, and we at his request and in his presence and in presence of each other have severally subscribed our names hereunto as attesting witnesses. John C. Halliger of Juneau Dodge Co. The State of Missouri, to any Judge or Justice of the Peace, or any Mayor or Chief Magistrate of any City in the County of Dodge, State of Wisconsin, Greeting: Know Ye that reposing confidence in your ability we do hereby empower you to cause to come before you at a time and place to be by you appointed, John C. Halliger and Matthias Potter, attesting witnesses to the annexed instrument of writing purporting to be the last will and testament of Ranslow Smith deceased: and the said Halliger and Potter to examine on oath touching their knowledge of the execution of said instrument of writing, and of the condition of mind of the said Ranslow Smith at the time of the publication of said instrument of writing. The examination of the said Halliger and Potter thus laden, you will reduce to writing and cause than to subscribe the same and the examination thus laden and subscribed you will certify to the Judge of our probate Court within and particular County in the state of Missouri under your hand. Witness John M. Caldwell, Judge of our said Probate Court, within and for Andrew County, Missouri: with the seal of said Court hereto affixed at the City of Savannah, in said County of Andrew this 22d day of January AD, 1875. Return to Commission to Prove Will. In pursuance of the authority to me given by the annexed commission, issued by the Clerk of the Probate Court within and for the County of Andrew and State of Missouri, I Edward Elwell, Judge of the County Court of Dodge County in the State of Wisconsin did on the 5th day of April, A.D. 1875, Cause to Come before me at the office of said County Judge of the Village of Juneau, Dodge County and state of Wisconsin, John C. Hagler and Matthias Potter who being by me, severally and each for himself duly sworn, deposeth and says that the annexed instrument, purporting to be the last will and testament of Ranslow Smith, late of the county of Andrew State of Missouri was on or about the date thereof towit: the 22d day of June A.D. 1865 at the Village of Juneau, Dodge County, Wisconsin, signed and sealed by the said Ranslow Smith and that he then and there acknowledged, published and declared said instrument to be his last will and testament in the presence of the said John C. Halliger and Matthias Potter the subscribing witnesses thereto: That the said John C. Halliger and Matthias Potter did then and there in the presence of the said testator, and at his request severally subscribe said instrument as attesting witnesses thereto and that at the time of the execution and publication of said instrument, the said testator was of sound and disposing mind, memory and understanding to the best of the said deponents knowledge and belief and was of full age and further deponent saith not. 5th day of April A.D. 1875. And I do hereby certify that the testimony of the said John C. Halliger and Mathias Potter was by me reduced to writing and by them subscribed In my presence on the day and year and at the place above written and their testimony so by me taken and certified, is herewith entered. County of Dodge } John C. Halliger, being duly sworn says that he resides in the City of Watertown Wisconsin: that the instrument here shown purporting to be the last will and testament of Ranslow Smith late of the County of Andrew in the State of Missouri deceased, was on or about the date thereof to wit: the 22d day of June A.D. 1865 at the Village of Juneau Dodge County, Wisconsin, signed and sealed by the said Ranslow Smith, that the said Ranslow Smith then and there acknowledged, published and declared said instrument to be his last will and testament in the presence of the said John C. Halliger and Matthias Potter the other subscribing witness thereto, that the said John C. Halliger and Matthias Potter did then and there in the presence of the said testator and at his request severally subscribe said instrument as attesting witnesses thereto: and that at the time of the execution and publishing of said instrument as aforesaid , the testator was of sound disposing mind, memory and understanding to the best of the said deponents knowledge and belief, and was of full age. Subscribed ands sworn to before me, this 5th day of April, A.D. 1875. County of Dodge } Test. Matthia Potter being duly sworn says that he resides in Juneau, Dodge County Wisconsin: that the instrument here shown purporting to be the last will and testament of Ranslow Smith late of the County of Andrew in the State of Missouri deceased, was on or about the date thereof to wit: the 22d day of June A.D. 1865 at the Village of Juneau Dodge County, and state of Wisconsin, signed and sealed by the said Ranslow Smith, that the said Ranslow Smith then and there acknowledged, published and declared said instrument to be his last will and testament in the presence of the said John C. Halliger and Matthias Potter the other subscribing witness thereto: that the said John C. Halliger and Matthias Potter did then and there in the presence of the said testator and at his request severally subscribe said instrument as attesting witnesses thereto: and that at the time of the execution and publishing of said instrument as aforesaid, the said testator was of sound, disposing mind, memory and understanding, to the best of the said deponents knowledge and belief, and was of full age. Subscribed and sworn to before me, this 5th day of April, A.D. 1875. County of Andrew } SS. I, John R. Caldwell, Judge of Probate in and for said Andrew County, having examined the foregoing instrument, purporting to be the last will of Ranslow Smith and signed by him: and having examined the depositions (properly taken and certified) of John C. Halliger and Matthias Potter the subscribing witnesses thereto on relation in the execution of the same, do declare and adjudge said instrument to be the last will and testament of the said Ranslow Smith late of Andrew County, deceased. [L.S.] In testimony whereof I have hereunto set my hand and affixed the seal of said Court at office in Savannah this 4th day of May A.D. 1875. _are unknown to him_, who resides in the County of ___ in the State of ______, _that Devere J. Smith one of the legatees in said will_ resides in the County of _Cloud_ in the State of _Kansas_. that the said _Ranslow Smith_ died _leaving_ a will; that _he_ will make a perfect inventory of, and faithfully administer all the estate of the deceased, and pay the debts as far as the assets will extend and the law _& will_ direct, and account for and pay all assets which shall come to _his_ possession or knowledge. Subscribed and sworn before me this _25_ day of _June_ A.D. 18_75_. Recorded this _25th_ day of _June_ A.D. 18_75_, J.R. Caldwell. We, _John B. Majors_ as Principal, and _August Schuster, J.W. Ent, and Henry M. Ogle_, as Securities, are held and firmly bound unto the State of Missouri, in the sum of _Four Hundred_ Dollars, for the payment of which we do hereby bind ourselves, our heirs, executors and administrators, firmly by these presents. Sealed with our seals and dated at Savannah, in the State aforesaid, this _24th_ day of _June_, A.D. 18_75_. The Condition of the above bond is that if the said _John B. Majors_, administrator, _with the will annexed_, of the Estate of _Ranslow Smith_, deceased, shall faithfully administer said Estate, account for, pay and deliver all money and property of said Estate, and perform all other things touching said administration, required by law or the order or decree of any Court having Jurisdiction, then the above bond to be void - otherwise to remain in full force and effect. STATE OF MISSOURI, County of Andrew. We do hereby appoint _John B. Majors, Administrator with the Will annexed_, of all and singular the Goods and Chattels, Rights and Credits, which were of the said _Ranslow Smith_at the time of _his_ death, _investing him the said Majors_ with full power and authority to secure, preserve and dispose of said Property according to law, and collect all moneys due said deceased, and, in general, to do and perform all other acts and things which are or hereafter may be may be required of _him_ by law. Recorded this _25th_ day of _June_, A.D. 18_75_, _J.R. Caldwell_, Judge. "_June_ Term, _June_ A.D. 188_5_. The remainder of this paper is too dark and smudged to accurately read. It is signed by the administrator, J.B. Majors and the Judge of Probate Court, P. Mercer. Estate of Ranslow Smith, deced. J.B. Majors administrator of said estate shows to the court that he has no assets of said estate in his hands, and that final settlement of the same is awaiting the termination of a suit in the Supreme Court of Missouri and said Settlement is continued to September Term A.D. 1884. J.B. Majors Administrator with the will annexed files final Settlement and it appearing that notice of such settlement has been published as required by law, the same is examined and approved, and it further appearing that there is a balance of $55.44 in the hands of said administrator, it is ordered by the court that he pay the same to J.D. Smith, legatee, and file receipt therefor in this Court and thereupon be discharged. J.B. Majors Administrator of said estate files receipt pursuant to order of this Court $55.44 signed by Mary Jane Sanborn by D.J. Smith and it is ordered that said Administrator be discharged. 1. Smith/Carringer Family Correspondence (Loose Letters, 1888–1902), Abigail (Vaux) Smith list of family births and deaths, Ranslow Smith birth entry, 11 July 1805, originals privately held by Randall J. Seaver, [address for private use], Chula Vista CA 91911, 1988 (great grandson). Family letters to and from Abigail (Vaux) Smith, Rebecca (Spangler) Carringer, and Della (Smith) Carringer. written by Abbie (Vaux) smith in about 1895, passed to Della (Smith) Carringer in 1931, to Lyle L. Carringer in 1946, to Betty (Carringer) Seaver in 1977, and to Randall J. Seaver (2nd great-grandson) in 1988. 2. 1830 United States Federal Census, Population Schedule, Jefferson County, New York, Henderson; page 101, Ranslow Smith household; digital image, Ancestry.com (http://www.ancestry.com)); citing National Archives Microfilm Publication M19, Roll 102. 3. Jefferson County [N.Y.] Clerk, "Deed Records (Jefferson County, New York); index, 1805-1966, 1805-1907," Family History Library (Salt Lake city, Utah), on 194 Reels of microfilm, citing original records in the Jefferson County Courthouse, Watertown, New York, Deed Book A3, page 512, recorded 26 July 1837, accessed on FHL Microfilm 0,879,966. 4. Jefferson County [N.Y.] Clerk, "Deed Records (Jefferson County, New York); index, 1805-1966, 1805-1907" , Deed Book L3, page 461, recorded 18 June 1840, accessed on FHL Microfilm 0,886,701. 5. Jefferson County [N.Y.] Clerk, "Deed Records (Jefferson County, New York); index, 1805-1966, 1805-1907" , Deed Book M3, page 303, recorded 28 October 1840, accessed on FHL Microfilm 0,886,702. 6. U.S. Bureau of Land Management, "Land Patent Search," indexed database, General Land Office Records (http://glorecords.blm.gov), entry for Ranslow Smith, Dodge County, Wisconsin Territory,Certificate No. 5545. 7. U.S. Bureau of Land Management, "Land Patent Search," indexed database, General Land Office Records, entry for Ranslow Smith, Dodge County, Wisconsin Territory, Certificate No. 3570. 8. 1850 United States Federal Census, Dodge County, Wisconsin, population schedule, Burnett; Page 43, Line 36, Ranslow smith household, online database, Ancestry.com (http://www.ancestry.com); citing National Archives Microfilm Publication M432, Roll 996. 9. 1860 United States Federal Census, Dodge County, Wisconsin, Population Schedule, Oak Grove; Page 745, Dwelling #704, Family #701, Ranslow Smith household; digital image, Ancestry.com (http://www.ancestry.com); citing National Archives Microfilm Publication M653, Roll 1406. 10. Andrew County, Missouri Probate Records, 1841-1918, on 14 FHL US/CAN microfilms, Family History Library, Salt Lake City, Utah; original records in Andrew County, Missouri, courthouse., Volume A, 1842-1888, Pages 360-365, Ranslow Smith will (court clerk's transcription) accessed on FHL US/CAN Microfilm 1,006,205. 11. Taylor County, Iowa, "Taylor County, Iowa, deed records, 1855-1953; index, 1855-1902", "Deed Records (Land) v. J (1867-1869) v. K-L (1867-1870)," Volume J, pages 60-61 (stamped), Deed of William Lewis Estate to Ranslow Smith, 1867; accessed 4 February 2014 on FHL US/CAN microfilm 1,535,632. 12. Taylor County, Iowa, "Taylor County, Iowa, deed records, 1855-1953; index, 1855-1902", "Deed Records (Land) v. M-N 1869-1872 v. O (to p. 311) 1872-1873," Volume M, page 80 (stamped), Deed of Devier J. Smith to Ranslow Smith, 1868; accessed 4 February 2014 on FHL US/CAN microfilm 1,535,634. 13. "Iowa County Marriages, 1838-1934," indexed database, FamilySearch (https://familysearch.org), record extraction, Ranslow Smith and Julia M. Johnson marriage entry, 8 October 1868, citing FHL Microfilm US/CAN 1035144. 14. Taylor County, Iowa, "Taylor County, Iowa, deed records, 1855-1953; index, 1855-1902", "Deed Records (Land) v. J (cont.) 1867-1869 v. K-L 1867-1870," Volume K, page 375 (stamped), Deed of Ranslow Smith to Harley U. Greenlee, 1869; accessed 4 February 2014 on FHL US/CAN microfilm 1,535,633. 15. Taylor County, Iowa, "Taylor County, Iowa, deed records, 1855-1953; index, 1855-1902", "Deed Records (Land) v. J (cont.) 1867-1869 v. K-L 1867-1870," Volume L, page 212 (stamped), Deed of Esther and John Craven to Ranslow Smith, 1869; accessed 4 February 2014 on FHL US/CAN microfilm 1,535,633. 16. Taylor County, Iowa, "Taylor County, Iowa, deed records, 1855-1953; index, 1855-1902", "Deed Records (Land) v. J (cont.) 1867-1869 v. K-L 1867-1870," Volume K, page 539(stamped), Deed of John Craven and wife to Ranslow Smith, 1869; accessed 4 February 2014 on FHL US/CAN microfilm 1,535,633. 17. Taylor County, Iowa, "Taylor County, Iowa, deed records, 1855-1953; index, 1855-1902", "Deed Records (Land) v. M-N (1869-1872), v. O (to p.311),", Volume L, page 205 (stamped), Deed of Ranslow Smith to Devier Smith, 1969; accessed 4 February 2014 on FHL US/CAN microfilm 1,535,633. 18. Andrew County Historical Society, Cemetery Inscriptions (Savannah, Mo. : the Society, 1977), Volume II, page 34, Ranslow Smith entry. 19. Andrew County, Missouri Probate Court, Probate records, 1841-1918; index to probate records, 1841-1976, Family History Library (Salt Lake City, Utah), citing original records in the Missouri County Courthouse, "Index to probate records 1841-1976," Case 1074, Ranslow Smith entry, accessed on FHL Microfilm US/CAN 1,006,198 Item 3, Page 47. 20. 1840 United States Federal Census, Jefferson County, New York, population schedule, Henderson town; Page 230, Ranslow Smith household, online database, Ancestry.com (http://www.ancestry.com); citing National Archives Microfilm Publication M704, Roll 291. 21. Jefferson County [N.Y.] Clerk, "Deed Records (Jefferson County, New York); index, 1805-1966, 1805-1907" , Deed Book P3, page 484, recorded 16 July 1841, accessed on FHL Microfilm 0,886,704. 22. 1870 United States Federal Census, Population Schedule, Taylor County, Iowa, Benton township: Page 13, Ranslow Smith household; online database, Ancestry.com (http://www.ancestry.com); citing National Archives Microfilm Publication M593, Roll 421.